It was part of a 1960 revue at the Nottingham Playhouse called You, Me and the Gatepost, performed for one night only, and then promptly forgotten. But the sketch, written by a 29-year-old Harold Pinter and lost for more than half a century, has re-emerged as a result of some diligent detective work and is published by the Guardianfor the first time and in full. The sketch, set on the sunbathed terrace of a large hotel and called Umbrellas, is very Pinter, and if there was any doubt who the author was, then the 12 designated pauses are something of a giveaway. Pinter's widow, Lady Antonia Fraser, said she had been "completely unaware" of the existence of Umbrellas. "It's fun. We've all been quarrelling over acting it in the family. I want to act B, which is the better part, but so far I've only managed to act A, so we're waiting for some really good actors to do it. 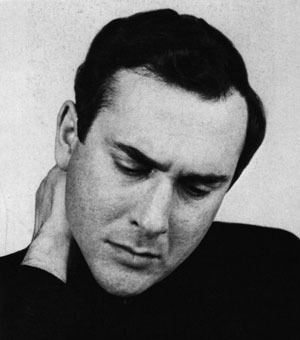 We tend to forget that, between the failure of The Birthday Partyin 1958 and the success of The Caretakerin 1960, Harold Pinter wrote many revue-sketches. While this latest example to come to light may be a squib, it's certainly not a damp one: try reading it aloud with someone and you'll see how it works. For a start it depends heavily for comic effect on the pauses between the lines: a skill which Pinter told me he'd acquired from seeing Jack Benny at the London Palladium in the late 1940s. As in all Pinter's sketches, you also get a hint of themes he was to explore in his plays. This one clearly is about power: character A smugly rejoices in the fact that he has it, while character B is left in a state of impotent envy. I wouldn't place this sketch on the same level of Pinter's miniature masterpiece, Last To Go, in which a coffee-stall owner and a newspaper seller fend off fear of loneliness and death through desultory chat. But it's wonderful to have a bit of newly-discovered Pinter. It also reminds us that, along with Peter Cook, Pinter was a prolific revue-sketch writer who used a popular form to explore the oddities of human behaviour. No Man's Land, Drama Theatre, Sydney Opera House, 1 November - 11 December, 2011.